Objection handling professionally creates high quality business. That’s a fact and is not going to change anytime soon. Your chances of dealing with objections effectively and securing the order increase dramatically if you understand how the buyer processes information and how you can benefit from how that process works. Objection handling and over coming objections used to take up a lot more time in my sale training courses than it does today. Understanding these three principles helps professional sales people succeed where others may falter. Overcoming Objections – Fail or Win? At some point every sales discussion will unearth some form of objections, resistance, sticking point. And that’s ok. It’s to be expected. The trouble sets in, and the chances of closing the sale drop, depending entirely on how the sales person deals with it. Objection Handling – What Next? Well if you just did the above, avoid the fails and practice the wins. you’d be streets ahead of many sales people. But, is that all there really is to overcoming objections? If you followed Disruptive Sales Methods to the words your first sales message is designed to grab the attention of your perfect prospect. But, what that might also do is to cause your prospect’s brain to go into fight or flight. This means, he’ll either try to rationalise with you, or he’ll dismiss you. The first reaction, you might get into a conversation, but there is already conflict there. the second option and he’s blocking your calls for ever. Highly disruptive sales pitches work, but you have to keep them high on curiosity. You must also keep it low on conflict, this way you avoid the ‘fight or flight’ limbic/prehistoric brain. Instead, what you might want to look at is how your opening statements can appeal to the more rational brain, because that would make sense, right? Because the truth is everything goes through the croc brain. If whatever you say doesn’t make it through the croc brain…it doesn’t make it anywhere. There is nooooo sales pitch. Leave, do not pass go, do not collect 200$. And that applies to everything you say in the sales pitch…the croc brain is on all the time. It’s the bit that keeps the buyer alive and out of harms way. So in a situation where you are selling to the buyer, it might well be on especially high alert. The good news is , once the croc brain relaxes, realises you’re not going to kill the buyer, you get to engage with the more logical elements of the buyer’s brain, but that doesn’t happen straight way. So, resistance free pitch, is possible, it’s just not a dead cert and it takes some work, but understanding how the buyer’s brain receives your sales pitch can definitely help you understand how to sell better and to avoid having to deal with objections. Yet most sales people will avoid any form of NO’ and at any cost. Well, rejection is no fun. Bouncing back from a ‘no’ takes guts and some confidence. 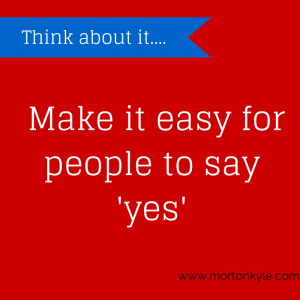 But what if we all thought of a ‘no’ as a bit of a check box exercise. Just to see how engaged the buyer is. To check the temperature of the discussion. To see how much further we need to push to get the order. Some people might call this a trial close…and that’s probably not where we are, it’s more of a same page confirmation. I might chuck in something like…Ok, well Mr Buyer, we’ve covered a lot of what I think we need to cover, but not everything, so before we move on, let me just ask you, what’s the best thing you’ve heard so far….and what’s the worst thing you’ve heard….that way I can see where I can save us some time moving forward, and you get the fullest understanding you need at this stage…so, best and worst please? If there is a ‘no’ then see above for how to handle it. If there is no ‘no’ offered, you’ve either got a non-committed buyer or a sale. But, how do you know? Ask, so if I were to ask you for the order now, you’re response would be yes? You know what to do either way. Why is Tension so important is sales calls now. It’s important because in any sales pitch the sales person should be creating contrast. Contrast between the now and the future with their product/service. Where there is no contrast…there is no compulsion to change. Where there is no tension, there is no contrast, and there is no compulsion to change. Think back to all those sales pitches. You really got on with the buyer. How many of those did you not get the order from, when you were totally convinced they were ready to buy? The truth is – tension creates need, and need drives change. If you need more sales create more tension. So, it might seem in the same blog post I’m advocating both the use and the avoidance of tension. It’s knowing when to avoid tension and when to create tension in the sales pitch that separates that super stars from the sales fails. We cover all of this in our sales training, both bespoke B2B sales training and our open sales training course – The Sales Improvement Workshop. 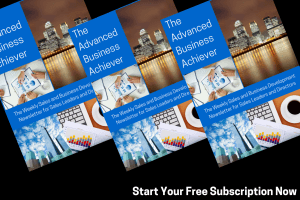 It even forms part of our online Sales Training TurboCharged Sales. 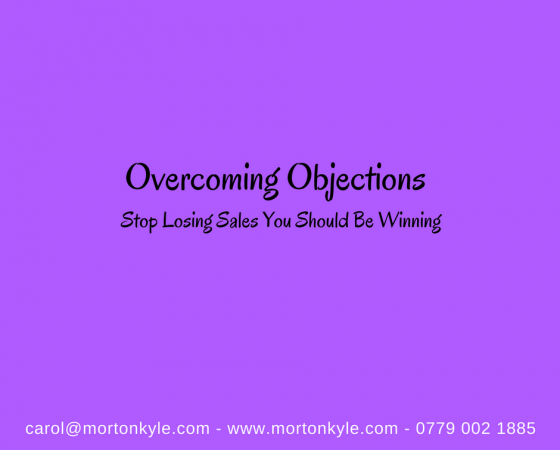 All of our sales training recognises that objection handling is a key part of being a good sales person, we also understand that there are a myriad of ways how sales pitches and sales call structures can either throw up or minimise the number of objections. Our sales training is designed to give the best possible selling and buying experience for both parties, and that objection handling done well can often increase the sales conversion rate. This entry was posted in Blog, Sales Training and tagged Account Based Selling, Advanced Selling, B2B Sales Training Courses, Basic B2B Sales Training Courses, Competitive Advantage Sales Training, Consultative Sales Training, Creating Tension in Sales Calls, Handling Objections, Objection Handling, Overcoming Objections, Sales Objection Handling, Sales Training, Solution Selling. Bookmark the permalink.